The job title of "Air transportation" personnel in the Air Force may seem like a redundant term, but they have some very specific duties that are crucial to the success of this branch of the U.S. military. These are the airmen who ensure that everyone on board a military aircraft is transported safely and efficiently. They're also responsible for making sure food, medical supplies, ground vehicles, and helicopters get where the Air Force needs them to be in a timely fashion. They're responsible for coordinating shipments of people and supplies around the world. At its most basic, this is the job within the Air Force that gives the U.S. Department of Defense the ability to move air passengers and cargo around the world. Air transportation personnel help ensure that all Air Force bases have the supplies and equipment they need. These airmen plan and organize air transportation activities, including determining the supplies, facilities, and personnel needed. 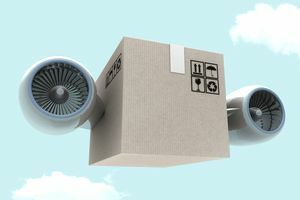 They'll establish procedures for loading both passengers and cargo aboard aircraft and implement any necessary safety precautions for handling dangerous materials, special cargo, mail, and baggage. Air transportation airmen are also tasked with directing air transportation activities, including unloading and any airdrops of supplies or other items. They establish procedures aboard aircraft for any passenger or aircraft clearance across international borders. These airmen are also called upon to inspect airlift activities, and recommend any needed corrective action, as well as providing any technical assistance that may be required. The basic education requirements for this position are a high school diploma or a general equivalency diploma (GED) with 15 college credits. Recruits for this job need to show ability in the mechanical segment of the Armed Services Vocational Aptitude Battery exam. A thorough understanding of passenger and cargo movement functions, completion of a basic air transportation course, and experience processing cargo, particularly when loading or unloading an aircraft are also needed. This includes learning to use the specialized equipment used to load and unload large and unusual cargo on Air Force aircraft. Prospective air transportation personnel must be between 17 and 39 years old to be able to qualify for the job and must have a state driver's license to operate government vehicles. They'll complete 7.5 weeks of basic training as well as airmen's week and will receive technical training at Fort Lee in Virginia. These airmen become experts in knowledge of aircraft types, capabilities and configurations, and learn such critical minutiae as aircraft weight and balance factors, cargo securing techniques, passenger service functions. They learn how to manage any automated data processing equipment and learn how to apply it in airlift activity. In addition, air transportation personnel learn some customer relations principles, because, despite the technical nature of much of their jobs, they still have to deal with humans on a regular basis.